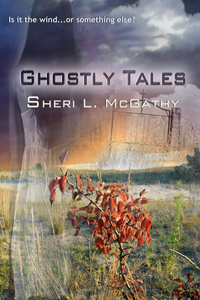 Ghostly Tales by Sheri L. McGathy is a collection of four short ghost stories set on the American prairie. They first made their debut in the anthology Trespassing Time. The stories range from the humorous to the scary, with ghosts that might make you smile, cause your heart to sigh, perhaps bring a tear to your eye, or maybe, just maybe, will give you pause as you pass an old cemetery. In “The Graveyard Dance” you discover that perhaps in the end, you really can go home. “Maxie” proves that love between a man and his dog can endure beyond death. “What’s a Ghost to Do?” takes a humorous look at the perils of haunting in today’s society while “Forgotten, But Not Gone,” serves as a warning to the living to not take what rightfully belongs to the dead.